If you do not use YouTube then I am convinced you have relocated to Mars or were living ‘underground’ for a considerable period of time. YouTube is the most popular video website that became viral long time ago; in fact in recent times it has evolved as an earning source for various users too. All this translates into one undisputable fact that there is traffic at YouTube and you can suffer consequently from buffering issues or having difficulty in watching or downloading your favorite videos. Now the problem in question is – how to speed up YouTube videos? The solution is simple i.e. to speed up YouTube so that you are spared the misery of waiting and ‘downloading errors’. There are two dimensions to this issue; one depends largely on what kind of internet connection you possess and secondly the servers and traffic volume at YouTube itself. The former is an issue which is terminal and requires switching from one ISP to the other depending on the choices available to you; the latter can be addressed to an extent with the help of different alternatives. 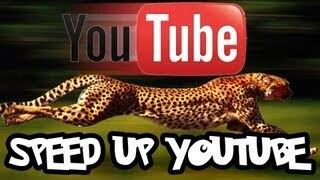 I am going to give you a few useful tips to speed up YouTube videos to an extent and enhance your viewing pleasure. There is a hidden program called 'YouTube Feather Beta'; you can join it and it happens to be an official you tube program with an option that effectively disable all ‘extras’ on the videos available at you tube. Thus you end up with zero buffering issues and can watch the videos at a faster pace. The negative effect is while choosing this option deprives you of the like/ dislike feature as well as posting comments on the video content. The list of related videos gets reduced as well which is not a bad trade if you know exactly what you want to view. You can install and use downloads accelerators such as 'Speed Bit' or any other suitable free program. These accelerators have the ability to improve the speed at which you tube videos are downloaded by applying multi-connection algorithm. It is better to choose an accelerator that has a positive vibe among the internet community. Do not attempt to buy accelerators for trial versions and some free soft ware can do the same task efficiently without you spending a dime. Changing your DNS can work at times too; Google claims that its public DNS service is a much better way to speed up your internet connection and in turn speed up watching videos at you tube or reading content online. It claims to choose a ‘route’ depending upon ‘optimization factor’ that can improve speed but of course there are no guarantees. This trick can work for you depending upon your geographic location and the traffic volume but it is worth giving a try when nothing else seems to work. Well I am not a judge to declare the best option for you; but all of them listed above are worth a shot. There are also programs like ‘spot flux’ that can disable advertisements and spamming which can to an extent also speed up you YouTube viewing. Trying these options involves no price tags so what you have got to lose?